In graphing a coordinate graph is a grid with x axes and y axes crossing through the center and the intersecting point is marked by a dot. On a graph-paper the two mutually drawn perpendicular straight lines X’OX and YOY’, intersecting each other at the point O. These perpendicular straight lines are known as coordinate axes. The line X’OX is called the x-axis and the line YOY’ is called the y-axis, while the point 0 is called the origin. The plane of the graph paper containing both the coordinate axes (x-axes and y-axes) is called the Cartesian plane. On right-hand side of the y-axis, every end-point of a square on the x-axis, represents a positive integer, as shown in the figure. On left-hand side of the y-axis, every end-point of a square on the x-axis, represents a negative integer, as shown in the figure. Above the x-axis, every end-point of a square on the y-axis, represents a positive integer, as shown in the figure. 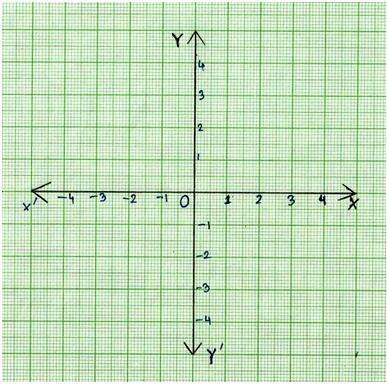 Below the x-axis, every end-point of a square on the y-axis,, represents a negative integer, as shown in the figure.